This simple to use economical fall alarm monitor includes a 10" x 30" pressure sensitive Bed Pad to provide and affordable and effective wireless monitoring solution. Patented Wireless CordLess® fall monitors and sensor pads help to reduce entanglement and tripping hazards. 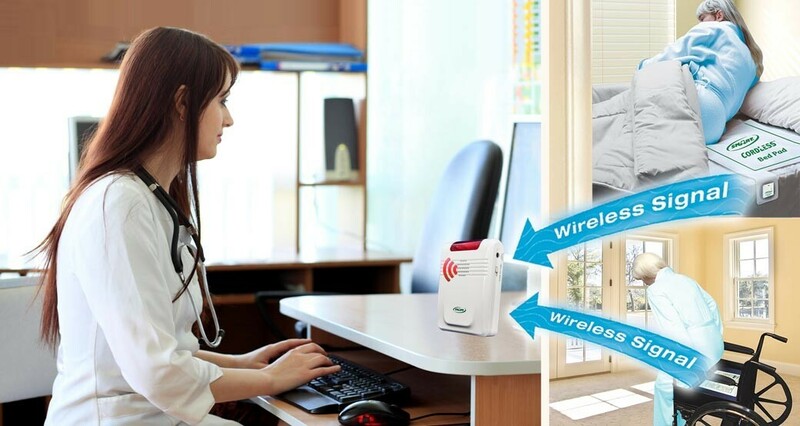 When using the Wireless CordLess® Bed Alarm Sensor Pad with the Wireless CordLess® Monitor you are able to remove the alarm noise from the room creating a quiet in room environment for the resident. Bed alarm pad is placed under resident on the bed. When resident gets up from pad, a wireless signal is sent to the monitor setting off the bed alarm to alert caregiver . A quiet solution for bed alarms for seniors. No Cords!, No Noise in their rooms! Combo Set: Includes Fall Alarm Monitor and 10" x 30" Bed Pad with 1-Year Warranty. Alarm tone will sound continuously when triggered by a component until it is reset by turning it off and on again. Fall Alarm Dimensions: 5" x 3-1/2" x 1"
Bed Pad Dimensions: 10" x 30"
Monitor can be placed outside of resident’s room so as to not startle resident. Signals up to 150 feet from the bed pad sensor, depending on building layout (which is sufficient for most home settings). Operates on 3 "C" batteries (not included) and can be used with an Optional AC Adapter (sold separately). Can be used as a free-standing unit or mounted on the wall with the included screws.